A mid-day tea is one of the most pleasant ways to spend your time and with some menu ideas for afternoon tea, you can offer your guests a relaxing and enjoyable party. 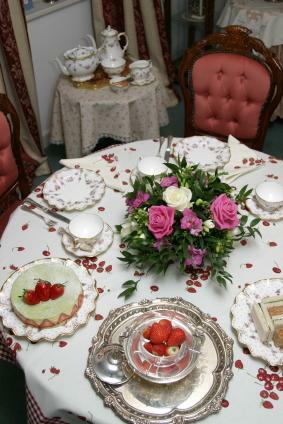 Afternoon tea is a time for women to get together for conversation, light sandwiches, and tea. Gone are the days of lace gloves and quite servants standing just outside the parlor in order to keep a steady supply of hot tea and fresh sandwiches flowing to the party, but this does not mean that your afternoon tea can't be a delightful success. When planning your afternoon tea, bear in mind that the tone as well as the menu should focus on the light and breezy, less like a bridal shower and more like a baby shower. All tea, except herbal teas, comes from the same plant. The variations like green tea, oolong, and black tea are simply different degrees of fermentation. Green tea is not fermented, oolong is half fermented, and black tea is fully fermented. Any other type of tea, like Earl Grey, is a blend of tea leaves and other flavoring agents. In the case of Earl Grey, the flavoring agent is bergamot oil. All trends, fads, and fashions aside, the best way to brew tea is to use loose leaves and put them directly into your teapot. Pour the boiling water into the pot and let the leaves steep for a few minutes. Then pour the tea through a strainer into the cup. Any addition of honey, milk, sugar, or lemon is entirely up to the tea drinker. I happen to like oolong all by itself or Earl Grey with lemon and honey. In a pinch, you can use teabags. I don't recommend them, but if your focus is on your menu ideas for afternoon tea and not on the minutia of tea making, then by all means use the tea bags, your guests will never know the difference. It goes without saying that any list of menu ideas for afternoon tea should include tea sandwiches. These are small, as in one single bite, sandwiches that are traditionally prepared with cucumbers or watercress. This is not to say that cucumbers and watercress are the only sandwiches you can serve, but to keep a bit of tradition to your tea party consider one or the other or both. Whether you are making the food yourself or having the affair catered, keep the focus on light small foods. Any appetizer that you like will work in this instance. I like tapenade because it can either be served already spread on small pieces of toast or you can pour it into a bowl and allow your guests to assemble their own appetizers. 1/2 pound of your favorite pitted olives. A mixture of different olives works best. Rinse the olives under cool running water. Pulse the food processor a few times until the mixture is blended but still has small chunks of olives in it. Place in refrigerator for a half hour before serving. Serve on thinly sliced pieces of toasted French bread. The sandwich is king at the afternoon tea so consider a selection of sandwiches for your guests. Any sandwich cut into finger-sandwich size will suffice. I would suggest egg salad, roast beef, or a selection of Panini sandwiches to give your guests a bit of variety from which to choose. Any tart recipe can be made into a tartlet with a few tartlet pans. The easiest to make are usually lemon tartlets, which would use a lemon curd recipe and a pie crust recipe. Other tart recipes that can be made into tartlets would include a peach tart or apricot tart. .